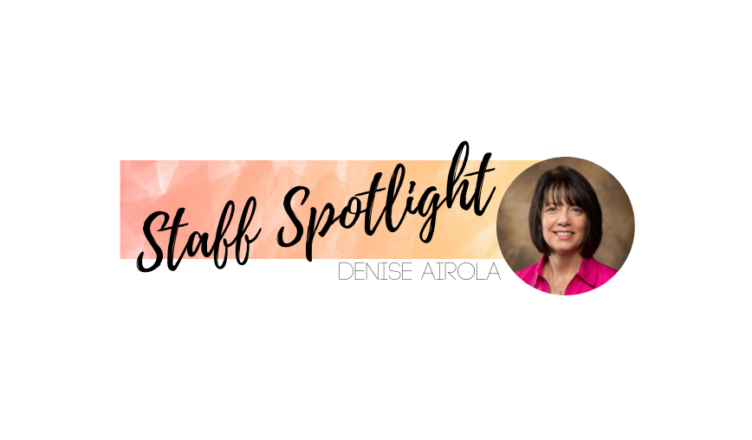 Denise Airola, The Office of Innovation for Education’s (OIE) fearless leader, leads by example in the office, local community, state and beyond. Integrity and her service-oriented, inquisitive personality have been at the core of her success. In her interview, she shares the fascinating story of how she got here and her passion for student-centered education. I grew up in a lot of places because my father was in the Marine Corps for 28 years. I consider Raritan, New Jersey my first home. My grandparents and many relatives on both sides of my family lived there and my parents used it as a home base–returning to live in town when my dad was at war or on overseas deployments. I went to 9 different schools from K through 12 in different parts of the country, mostly in Virginia, North Carolina, and New Jersey–so you could say I was a highly mobile child and I would have been marked as a dependent of active duty military if that classification had existed back then. I moved among a lot of different school and community cultures because of my father’s service in the Marine Corps. In all those moves across the country we only lived on a military base for 4 out of the 13 years of my K-12 schooling so we really were embedded in different communities and cultures. When I was a child, most military dependents lived and went to school on a military base-which provided its own unique culture based on your parent’s rank and mode of service in the military. I attended private schools at times and public schools at times and these school cultures were more reflective of the community itself with culture based more in socioeconomic status, ethnic origin, and/or race–and this differed distinctly in different parts of the country where I lived. For example, in fifth grade I attended public school in a small community in North Carolina called Winterville. We lived here for approximately 18 months while my father completed 18 credit hours in residence at East Carolina University to finish his Bachelor’s degree. We were a family of six and he was our sole income earner. The Marine Corps paid him for weekends and holidays because of his limited duty to complete his degree. I road a bus for over an hour to get to school and over an hour home. It was the first year that North Carolina finally desegregated schools. My sisters and brother and I seemed to be the only kids in Winterville schools who had learned alongside African American kids before. We didn’t realize how different we were because of this–how treating other students the same regardless of skin color was socially different–but other white students sure let us know that our behavior was not acceptable to them. After a year and a half of navigating a culture in which we never quite fit, my father was transferred from North Carolina to the Navy Yard in Philadelphia in March of my 6th grade year. We lived in a house in Willingboro, NJ –(Google ‘Levittown, PA’ to learn more). It was a community of middle and lower-middle class families commuting to Philly or Trenton, NJ for work. Again, I learned how different our family was from the families we lived among. If you aren’t from New Jersey you can be forgiven for not knowing that living in south Jersey, right across the Delaware River from Philly, is like being in another state compared to north and central Jersey where our extended family still lived. On top of that, March of your sixth grade year is a terrible time to assimilate into a new culture. Think middle school mean girls–my clothes were all wrong, my accent was all wrong–you get the picture! To survive junior high and I learned to code switch. I could switch between North Carolina drawl, north Jersey/New York accent, and Motown Philly south jersey accent depending on the situation. My father drove me into Philly everyday to swim for Vesper Boat Club, a team coached by a former olympic swimmer with a record of producing Olympians himself. Yet again, I encountered another culture–that of my teammates–Philadelphia privilege. I swam with Grace Kelly’s niece and other Philadelphia family notables. I became a national level swimmer but I felt a greater sense of belonging in the more inclusive socioeconomic/ethnic/race culture of south Jersey. By the time I graduated from high school I had learned that there were subcultures that were definitely not integrated–not in Philly, not in south Jersey–and I learned how to avoid those subcultures. I received a swimming scholarship to Syracuse University where I finished a Bachelor’s Degree in 1982 in Environmental Science from Syracuse University and the State University of New York College of Environmental Science and Forestry (SUNY-CESF). I received a graduate fellowship to study biological oceanography in Rhode Island. In the summer between undergrad and graduate school I met my husband. After a semester of graduate school he convinced me to marry him and follow him to California where he would be stationed as a second lieutenant in the US Marine for the next three years. This was yet another culture shift–southern California and the culture of the Marine Corps–not as a child, but as a Marine officer’s wife. We received a handbook on how to be a good officer’s wife. The handbook described the role of a wife and stated that my first priority was to be a Marine Corp wife and my job was to support my husband. Having a job outside of that, or a career for that matter, was frowned upon by senior wives. However, all that time alone (my husband was out training or deployed for 18 months of our first year of marriage) was too much time alone for me. California was desperate for math and science teachers so I went back to graduate school, this time for education. I earned my teaching credential for K-12 which included high school sciences. In one of my first interviews for a teaching job, I was asked “Do you want to be an information disseminator, or do you really want to teach and be creative?” That sounded like a no-brainer to me. I chose elementary because I loved learning and I wanted to create and design learning that ignited that same passion for learning that was inspired in me from summer jobs teaching outdoor school and naturalist hikes. I taught fourth and sixth grade in Laguna Niguel California for 2 years before we were transferred to Quantico, Virginia. By this time we had a daughter of our own and I stayed home with her and her new baby sister. Even though my husband spent more time on the tank trails training up new officers I was no longer home alone and two children under the age of two kept me very busy. My daughters taught me so much about early child development that I had learned in psychology and education classes, and hadn’t experienced as a teacher. My husband resigned his commission after 6 years to seek a career in the corporate world. He was recruited by JB Hunt and we found ourselves moving to Fayetteville, AR. At this point the girls were one and three years of age. I didn’t want to go back to work since quality child care was very difficult to find in northwest AR in the early 90s. I became an entrepreneur and opened my own child care program. This allowed me to be with my girls and to serve our community by providing a high quality option for child care. We had our third daughter in 1993 and our pocket books were ready for more income than my director’s job could afford. I went back to to public school teaching in the 1995-96 school year. I taught grades 4, 5, and 6 in Fayetteville at Jefferson Elementary. It was in this setting that I was able to bring together my teaching expertise and my experience in supporting healthy child development and social/emotional learning to benefit my students. Jefferson served students among whom 95% received free or reduced lunch. I learned so much from those students about how to be a responsive, student-focused teacher. I served students whose math and reading levels ranged from 1st grade to 9th grade. Our upper grades team worked together to provide each student with curriculum and learning experiences that were sensitive to their achievement levels yet also mindful of moving them toward or accelerating them beyond grade level. In my first year teaching I identified five students who were needing gifted services whose needs had been previously overlooked due to their behavior. I helped our students design a survey to capture the most important issue to their classmates for them to address. Our student council raised $3,000 to replace their unsafe playground by hosting their own fundraisers. Their contribution, given the socioeconomics of their neighborhood, and their presentation of the survey data, physical evidence of safety issues, and their proposed plan moved the hearts of the Parks and Recreation Board of Directors and the FPS facilities manager so much that these two entities contributed the remaining $35,000 to get it done and Jefferson students had a new, safer playground the next year. If I were in the classroom today, doing what I did in the mid-90s to 2000s, you would describe my classroom as a student-focused learning system. My students accessed a rigorous curriculum and used multiple modalities to learn and demonstrate their learning. I used formative assessment regularly, having developed a repertoire of skills in my informal outdoor school teaching and my formal training and experience in California. In the late 1990s I participated in a district-wide leadership effort to deepen math and science learning with the goal of improving student achievement on the Arkansas Benchmark and End of Course Exams. I moved from teacher leader to curriculum supervisor, professional development leader, etc. As our district dug deeper into the criterion-referenced test scores, as well as the norm-referenced test scores, I started having a lot of questions about large scale assessments. Finally, if I was going to answer my own questions about testing and measurement I was going to have to go back to school. To afford this I went to work at NORMES at the University of Arkansas. I explored a leadership credential and degree but it wasn’t my cup of tea. I found my happy space in education statistics and research methods with a keen interest in measurement. I finished my PhD in 2011 and continued to study the use of large scale assessments. By this time I was working at the Arkansas Leadership Academy as a research specialist. I wanted the dots between summative testing scores and classroom learning to connect more clearly or at least more directly. Yet , the more I learned the more I came to understand the limitations and appropriate uses of large scale assessment scores. And, I couldn’t stay disconnected from how testing and measurement impacted what was going on in districts, schools, and classrooms. I wanted to apply my PhD in a way that was informed by my classroom experience and my time in administration. In 2013 I was asked to start the Office of Innovation for Education. Once again, I entered the risky world of entrepreneurship and it was the best risk I have ever taken. Our work is so central to the core of all the things I have learned and value about public education. I get to be a learner everyday. I get to inquire into my own effectiveness as a leader, as a member of a talented team of professionals charged with work that is life-changing for students in Arkansas. I get to connect the dots between developing and supporting student-focused learning systems and the bigger policy ideas of equity, transformation, and accountability. My life experiences have prepared me for this work in a way that I would never have imagined all those years ago. What is your role at the Office of Innovation for Education? I am the director of the office. My role is to lead, shepherd, corral, give permission, flex boundaries, find resources, buffer competing demands, filter out the unnecessary–whatever it takes to enable our office and talented staff to do the work that is necessary to support the mission and achieve the goals and vision for our work which is integrated in the Vision for Excellence in Education in Arkansas. A leader is strategic–strategic in thinking, acting, reflecting, and decision-making. A leader finds talented team members and enables those teams to function so that they can accomplish the work that leads to achieving the goals and vision. For me, that means being in the background as much as possible and facilitating support, development, and resources for team members to do their work. It means creating and strategically changing enabling structures and routines for the office to function at its optimum. At times it means being front and center when my presence is needed to filter, buffer, represent, and influence as needed. I keep a pulse on what our teams need to maximize their efforts while also supporting them in their professional goals and their personal well-being. My hope is that this results in a work environment where team members are empowered to exercise their talents to achieve outcomes effectively, to grow professionally, and to attend to their personal well-being. In high school and college I never thought I was good enough in math. Math wasn’t easy for me all the time and definitely, it was not as easy for me as it was for some of my classmates. I held myself back from pursuing a career in biochemistry because to do so you have to take physical chemistry and my peers said it was really hard math. Rather than try and not be perfect at it, I chose to avoid it all together by choosing research science that didn’t require ‘P-Chem’. Later, as a teacher, when I taught math for conceptual understanding to 4th, 5th, and 6th graders I came to understand math in a more organic way–it helped me develop a growth mindset of my own toward math because I was encouraging my students to try different ways to come to conceptual understanding and to share their thinking with each other. In doing so I learned so much about math and it became less mysterious to me. When I started in my Master’s program for education statistics I put aside my personal perfectionism. In my advanced statistics classes I learned that math is just one more learning space where it isn’t about how hard or easy it is for a person, it is about how you learn it–how it makes sense to you–that can be very different for different people. And, that it is about persistence in that moment of struggle. You see, I was praised a lot in K-12 for the things that came easy to me, so I equated easy with intelligence and aptitude. My students taught me that wasn’t the case. Success in something is more about our persistence and our belief that we can access it if we look for ways that work for us. So we shouldn’t judge ourselves by how easy or how hard something is for us–we should work to find the way(s) that work for us for our own learning. What is your favorite thing about working at the Office of Innovation for Education? Our work is so fascinating and the people who make up the OIE are so talented in such diverse ways. That combination is motivating and special. I feel like every day is an adventure and every day we have the privilege to do something important to advance education and equity in Arkansas.